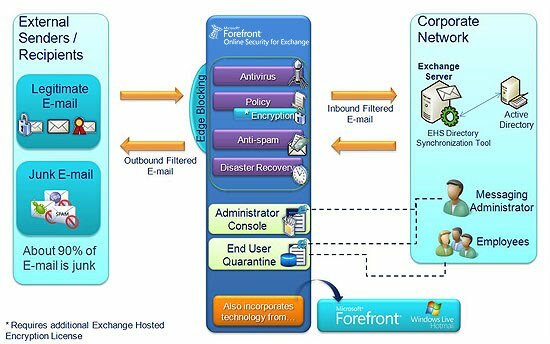 Forefront Online Protection for Exchange helps administrators enforce policies they set up to comply with corporate policies on e-mail usage and with government regulations. Using layers of anti-spam technology and multiple antivirus engines, Forefront Online Protection for Exchange removes spam and viruses—both known and unknown—from e-mail before the malware reaches corporations. Real time reporting and the powerful Message Trace tool give administrators insight into their e-mail environment by retrieving the status of any e-mail processed by Forefront Online Protection for Exchange in real-time. If the destination e-mail server becomes unavailable for any reason, Forefront Online Protection for Exchange helps to ensure no e-mail is lost or bounced by automatically queuing e-mail for up to five days, attempting to deliver the e-mail every 20 minutes. The Secure Messaging solution helps you deliver more secure business communication from virtually anywhere and on virtually any device, while preventing unauthorized use of confidential information.